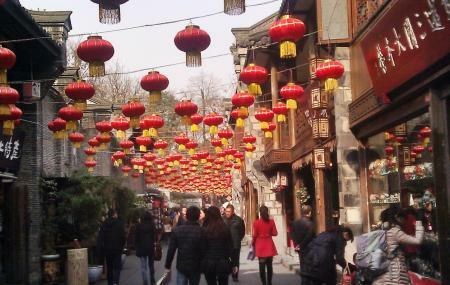 Considered as a landmark, Jinli Street dates back to Qin dynasty (221-263 BC). Then famous for Baldachin- a rice ornate cloth, today, it proudly flaunts the Wuhou memorial temple and the cultural panorama it presents before the world. The imposing archway at one end of the street depicts architectural form of Qing Dynasty. The entire street is lined up with stores selling Shu Embroidery, lacquer products, folk handicrafts, curios, or calligraphies and paintings. There are shadow puppetry shows, artisans putting up exhibits of traditional skills like paper and clay arts, bunch of cafes to chill, local food stalls serving scrumptious Chinese delicacies. There is also an exclusive wooden stage where you can catch up a live Sichuan opera, open air-movies or even a local wedding ceremony. On traditional festivals, there are plenty of theme activities and competitions that add pep to the lively street. Visit Jenli Street, hog on the San Da Pao and live it up Chengdu style! Soaked in oriental charm, the Jinli Pedestrian Street is Chengdu’s most beautiful street. While there are no Jinli Pedestrian Street Tickets, you can check out our tours comprising this popular attraction with some irresistible Deals on Tickets for Jinli Pedestrian Street. If you don’t want to miss out the early booking discounts, buy tickets for Jinli Pedestrian Street at the earliest. Jinli Pedestrian Street ticket prices and prices for adjoining attractions are however subject to change. Plenty of cafes, eateries and food stalls are available. How popular is Jinli Pedestrian Street? People normally club together Sanxingdui Museum and Chengdu Renmin Park while planning their visit to Jinli Pedestrian Street.